The cryptocurrency NoLimitCoin (NLC2) is bringing blockchain technology to fantasy sports, with our platform called No Limit Fantasy Sports. The platform has now integrated a Visa, MasterCard and Alipay direct purchase method to buy NLC2 from the exchanges. Visa and MasterCard offer the world’s most used and accepted credit cards. Click here for Instructions on how to buy NLC2 Now with Visa, Mastercard, Alipay. The integration of direct payments with Visa, MasterCard and Alipay will play a big part in market penetration making the purchase of cryptocurrency faster and simpler than ever. It will be among the few cryptocurrencies that will allow such purchases making NLC2 an easy way to enter Bitcoin and other coins as NLC2 is freely exchangeable for Bitcoin and other coins. These features mean that fantasy sports players and cryptocurrency investors all over the world now have convenient alternate methods to move their Fiat currency into the cryptosphere via NLC2 nonetheless. 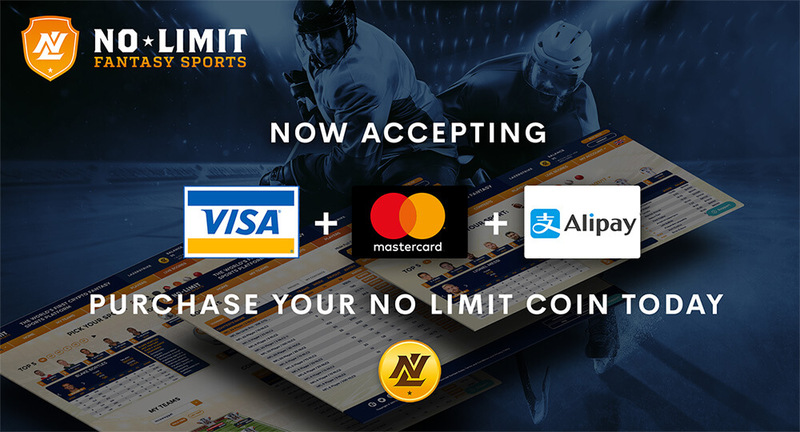 Having partnered with some of the most influential figures in sports such as Joe Theismann, a former NFL Super Bowl champion, and Johnny Chan, a legend in the poker world, NoLimitCoin offers Fantasy Sports to crypto enthusiasts and sports fans alike. You can see Joe Theismann’s influence promoting NLC2 here in this video. Together with Johnny Chan NoLimitCoin will start approaching different gaming platforms to use NLC2 as a currency, including several poker sites. NoLimitCoin will also be recording a video commercial with Johnny Chan in both English and Chinese to promote it’s coin to a global market. In addition, we recently upgraded our platform (www.cryptofantasysports.com) featuring Fantasy Football, Soccer and NHL. All other major sports will all be added throughout the end of 2017 and into 2018 including NBA, MMA, Cricket and MLB. No Limit Fantasy Sports is also able to charge up to 50% less fees than their competitors DraftKings and FanDuel because of its unique approach of using cryptocurrency for fantasy sports. Other important developments will include deployment of Daily Fantasy NBA, addition of NLC2 to other exchanges, translations into multiple languages and NoLimitCoin is planning to do a unique update to it’s platform to help bring Fantasy Sports to the crypto world in a very unique way. No Limit Fantasy Sports is working with Korean, Chinese and Japanese translators to get all documents and websites translated and ready for their push into the Asian markets and exchanges. NLC2 enjoys a deployed and working platform as well as vibrant, passionate and dedicated community making NLC2 a premier cryptocurrency.